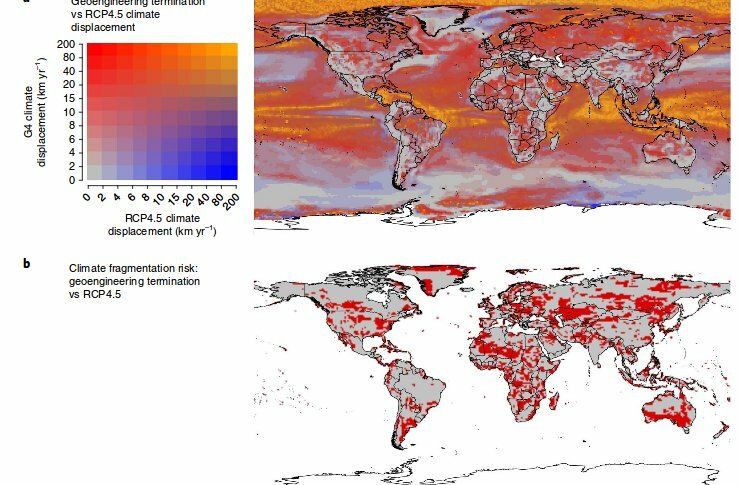 In Potentially dangerous consequences for biodiversity of solar geoengineering implementation and termination (published in Nature Ecology and Evolution, Sci-Hub mirror), a group of cross-institutional US climate scientists model what would happen if human embarked upon a solar geoengineering project to mitigate the greenhouse effect by aerosolizing reflective particles into the atmosphere, then gave up on the project after a mere half-century. The model shows catastrophic outcomes: while the project is running, habitats are well-protected from climate change and animals cease chasing new latitudes they can survive in. But when the project is abandoned, all the effects of climate change are felt at once, and any capacity to outrace climate change through migration is wiped out, along with the species that could have benefited from it. 50 years is a very long time in politics, and an eyeblink in geological timescales. Any geoengineering project will have to be unthinkably well-insulated from shifts in the political winds in order to avoid jeopardizing the planet. All living things have to move four and six times faster than they do today, and around three times faster than they would in the non-geoengineering temperatures in 2070, to survive the heat. In tropical areas, which have the highest biodiversity, organisms would have to move at around 9.8 kilometers per year, or around 6 miles per year, which is far above the maximum speed the majority of organisms can move. This is especially bad for tropical species, which are less heat tolerant. Figure 2 in the paper comparing temperature velocities with and without geoengineering at 2020, when it is initially implemented, and in 2070, after it has been terminated.